Every company should plan regular architecture capability maturity assessments using a model. These should provide a framework that represents the key components of a productive enterprise architecture process. A model provides an evolutionary way to improve the overall process that starts out in an ad hoc state, transforms into an immature process, and then finally becomes a well defined, disciplined, managed and mature process. The goal is to enhance the overall odds for success of the Enterprise Architecture by identifying weak areas and providing a defined path towards improvement. As the architecture matures, it should increase the benefits it offers the organization. Architecture maturity assessments help to determine how companies can maximize competitive advantage, identify ways of cutting costs, improve quality of services and reduce time to market. 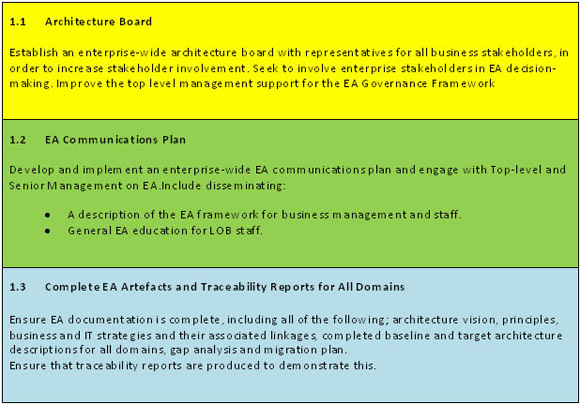 These assessments are undertaken as part of the Enterprise Architecture management. 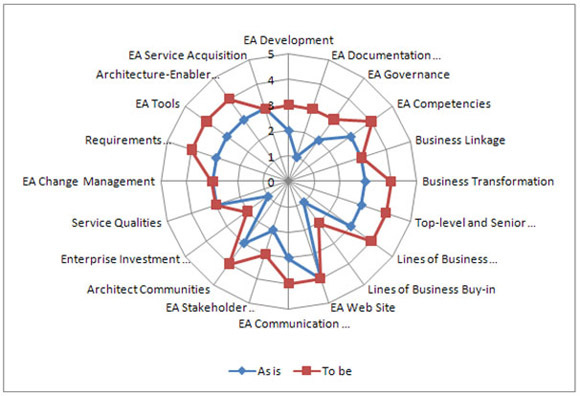 There are some methodologies for assessment of the comprehensive Enterprise Architecture maturity. Examples of these are the U.S. Department of Commerce ACMM, the Open Group architecture maturity model and a BSC-based Architecture Score Card presented by IFEAD. For application or technology portfolios, portfolio evaluation models can be used. 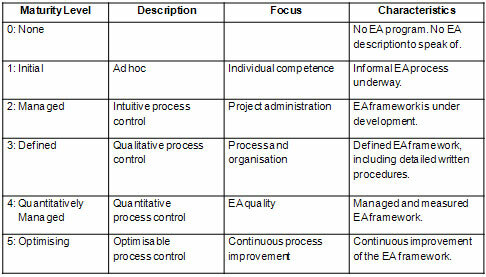 As a part of project development, assessments (in reality compliance) of architecture solutions are made against the business objectives and requirements (desired process and service structures and business models) and the constraints derived from the Enterprise Architecture context (these may be standards, principles, policies or other restrictions for solution development). Assessment and compliance of technologies are also a central part of Enterprise Architecture development projects. Finally, the development of Enterprise Architectures undergoes the scrutiny of the software development quality assurance method in use. Many IT providers have adopted a comprehensive software quality assurance approach like CMMI, or ISO/IEC 15504 (known as SPICE). Using the Architecture Capability Maturity Model from TOGAF® 9.1 is a great way of evaluating the way companies have implemented the framework, to identify the gaps between the business vision and the business capabilities. Unfortunately no sufficient assessment instruments or tools have been developed for TOGAF based assessments. Planning & preparation workshop with the stakeholders. Stakeholders should represent both Business and IT. 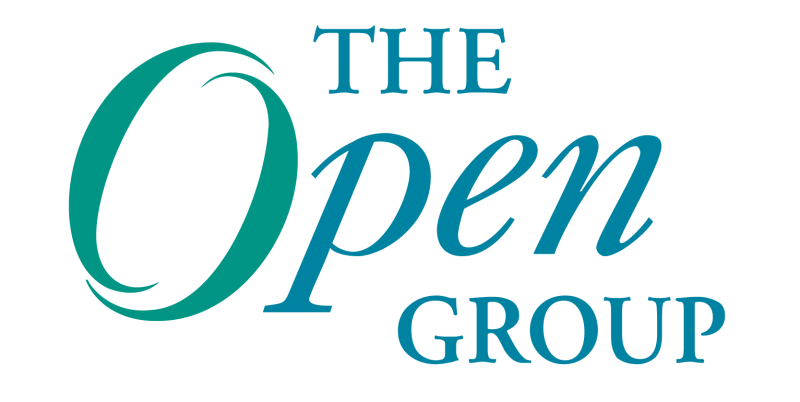 Interviews with stakeholders based on a questionnaire related to all process areas (elements in TOGAF) or domains that have characteristics important to the development and deployment of Enterprise Architecture. 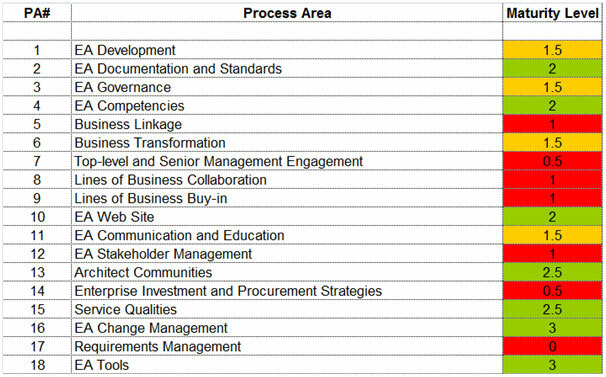 Each process area could be divided into a number of practices, which are statements that describe the process area for each level of maturity, on a scale of 0 to 5. Each practice would have a set of practice indicators, evidence that the requirements for a process area to be at a given level have been met. A set of questions that will be asked in the interviews establishes whether or not the practice indicators exist and thus the level of maturity for the practice. If all the practices for a given level within a Process Area are present, then that level will be achieved. Ideally, directly relevant documentary evidence will be provided to demonstrate that the practice Indicator exists. As this is not always practical, sometimes for this exercise, only verbal evidence from subject matter experts will be considered. We then deliver a report which includes the maturity of each process area or element (There are more elements in this example than those in the chapter 51 of the TOGAF® Version 9.1). Based on results from Phase 1, a consensus workshop would produce a roadmap and action plan with recommendations to attain the next required level of maturity. 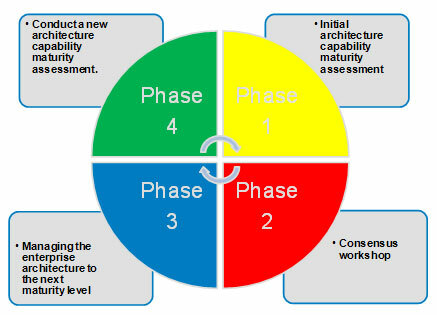 Phase 3 would be the management of Enterprise Architecture as described in the report and Phase 4, which is similar to Phase 1. Conducting an evaluation of an organization’s current practices against an architecture capability maturity assessment model allows companies to determine the level at which it currently stands. It will indicate the organization’s maturity in the area of Enterprise Architecture and highlight the practices that the organization needs to focus on in order to see the greatest improvement and the highest return on investment. The recommendation is that assessments should be carried out annually. Serge Thorn is CIO of Architecting the Enterprise. He has worked in the IT Industry for over 25 years, in a variety of roles, which include; Development and Systems Design, Project Management, Business Analysis, IT Operations, IT Management, IT Strategy, Research and Innovation, IT Governance, Architecture and Service Management (ITIL). He is the Chairman of the itSMF (IT Service Management forum) Swiss chapter and is based in Geneva, Switzerland. 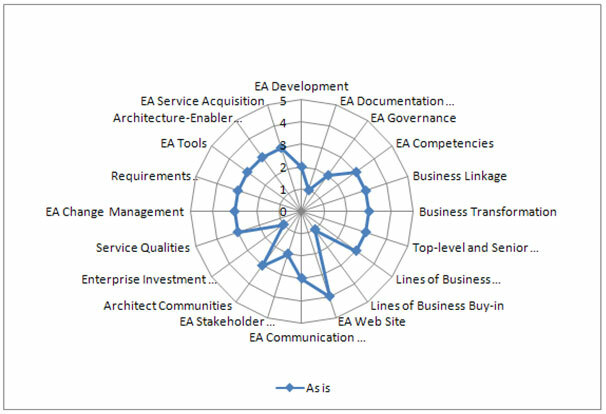 Enterprise architecture maturity assessments are important so businesses can pinpoint both weaknesses and areas of potential. Never assume “as it is” is the best solution.